This article is about the prehistoric land bridge. For the battle of World War I in Beringia, Darfur, see Anglo-Egyptian Darfur Expedition § Battle of Beringia. 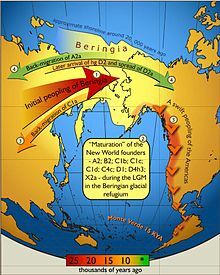 Beringia is defined today as the land and maritime area bounded on the west by the Lena River in Russia; on the east by the Mackenzie River in Canada; on the north by 72 degrees north latitude in the Chukchi Sea; and on the south by the tip of the Kamchatka Peninsula. It includes the Chukchi Sea, the Bering Sea, the Bering Strait, the Chukchi and Kamchatka Peninsulas in Russia as well as Alaska in the United States. The area includes land lying on the North American Plate and Siberian land east of the Chersky Range. Historically, it formed a land bridge that was up to 1,000 kilometres (620 miles) wide at its greatest extent and which covered an area as large as British Columbia and Alberta together, totaling approximately 1,600,000 square kilometres (620,000 square miles). Today, the only land that is visible from the central part of the Bering land bridge are the Diomede Islands, the Pribilof Islands of St. Paul and St. George, St. Lawrence Island, and King Island. The term Beringia was coined by the Swedish botanist Eric Hultén in 1937. During the ice ages, Beringia, like most of Siberia and all of North and Northeast China, was not glaciated because snowfall was very light. It was a grassland steppe, including the land bridge, that stretched for hundreds of kilometres into the continents on either side. It is believed that a small human population of at most a few thousand arrived in Beringia from eastern Siberia during the Last Glacial Maximum before expanding into the settlement of the Americas sometime after 16,500 years BP. This would have occurred as the American glaciers blocking the way southward melted, but before the bridge was covered by the sea about 11,000 years BP. Before European colonization, Beringia was inhabited by the Yupik peoples on both sides of the straits. This culture remains in the region today along with others. In 2012, the governments of Russia and the United States announced a plan to formally establish "a transboundary area of shared Beringian heritage". Among other things this agreement would establish close ties between the Bering Land Bridge National Preserve and the Cape Krusenstern National Monument in the United States and Beringia National Park in Russia. The remains of Late Pleistocene mammals that had been discovered on the Aleutians and islands in the Bering Sea at the close of the nineteenth century indicated that a past land connection might lie beneath the shallow waters between Alaska and Chukotka. The underlying mechanism was first thought to be tectonics, but by 1930 changes in the icemass balance, leading to global sea-level fluctuations, were viewed as the cause of the Bering Land Bridge. In 1937, Eric Hultén proposed that around the Aleutians and the Bering Strait region were tundra plants that had originally dispersed from a now-submerged plain between Alaska and Chukotka, which he named Beringia after Vitus Bering who had sailed into the strait in 1728. The American arctic geologist David Hopkins redefined Beringia to include portions of Alaska and Northeast Asia. Beringia was later regarded as extending from the Verkhoyansk Mountains in the west to the Mackenzie River in the east. The distribution of plants in the genera Erythranthe and Pinus are good examples of this, as very similar genera members are found in Asia and the Americas. During the Pleistocene epoch, global cooling led periodically to the expansion of glaciers and lowering of sea levels. This created land connections in various regions around the globe. Today, the average water depth of the Bering Strait is 40–50 m (130–160 ft), therefore the land bridge opened when the sea level dropped more than 50 m (160 ft) below the current level. A reconstruction of the sea-level history of the region indicated that a seaway existed from c. 135,000 – c. 70,000 BP, a land bridge from c. 70,000 – c. 60,000 BP, intermittent connection from c. 60,000 – c. 30,000 BP, a land bridge from c. 30,000 – c. 11,000 BP, followed by a Holocene sea-level rise that reopened the strait. Post-glacial rebound has continued to raise some sections of coast. During the last glacial period, enough of the earth's water became frozen in the great ice sheets covering North America and Europe to cause a drop in sea levels. For thousands of years the sea floors of many interglacial shallow seas were exposed, including those of the Bering Strait, the Chukchi Sea to the north, and the Bering Sea to the south. Other land bridges around the world have emerged and disappeared in the same way. Around 14,000 years ago, mainland Australia was linked to both New Guinea and Tasmania, the British Isles became an extension of continental Europe via the dry beds of the English Channel and North Sea, and the dry bed of the South China Sea linked Sumatra, Java, and Borneo to Indochina. The last glacial period, commonly referred to as the "Ice Age", spanned 125,000–14,500 YBP and was the most recent glacial period within the current ice age, which occurred during the last years of the Pleistocene era. The Ice Age reached its peak during the Last Glacial Maximum, when ice sheets began advancing from 33,000 YBP and reached their maximum limits 26,500 YBP. Deglaciation commenced in the Northern Hemisphere approximately 19,000 YBP and in Antarctica approximately 14,500 years YBP, which is consistent with evidence that glacial meltwater was the primary source for an abrupt rise in sea level 14,500 YBP and the bridge was finally inundated around 11,000 YBP. The fossil evidence from many continents points to the extinction of large animals, termed Pleistocene megafauna, near the end of the last glaciation. During the Ice Age a vast, cold and dry Mammoth steppe stretched from the arctic islands southwards to China, and from Spain eastwards across Eurasia and over the Bering land bridge into Alaska and the Yukon where it was blocked by the Wisconsin glaciation. The land bridge existed because sea-levels were lower because more of the planet's water than today was locked up in glaciers. Therefore, the flora and fauna of Beringia were more related to those of Eurasia rather than North America. Beringia received more moisture and intermittent maritime cloud cover from the north Pacific Ocean than the rest of the Mammoth steppe, including the dry environments on either side of it. This moisture supported a shrub-tundra habitat that provided an ecological refugium for plants and animals. In East Beringia 35,000 YBP, the northern arctic areas experienced temperatures 1.5 °C (2.7 °F) degrees warmer than today but the southern sub-Arctic regions were 2 °C (4 °F) degrees cooler. During the LGM 22,000 YBP the average summer temperature was 3–5 °C (5–9 °F) degrees cooler than today, with variations of 2.9 °C (5.2 °F) degrees cooler on the Seward Peninsula to 7.5 °C (13.5 °F) cooler in the Yukon. In the driest and coldest periods of the Late Pleistocene, and possibly during the entire Pleistocene, moisture occurred along a north-south gradient with the south receiving the most cloud cover and moisture due to the air-flow from the North Pacific. In the Late Pleistocene, Beringia was a mosaic of biological communities. Commencing from c. 57,000 BP (MIS 3), steppe–tundra vegetation dominated large parts of Beringia with a rich diversity of grasses and herbs. There were patches of shrub tundra with isolated refugia of larch (Larix) and spruce (Picea) forests with birch (Betula) and alder (Alnus) trees. It has been proposed that the largest and most diverse megafaunal community residing in Beringia at this time could only have been sustained in a highly diverse and productive environment. Analysis at Chukotka on the Siberian edge of the land bridge indicated that from c. 57,000 – c. 15,000 BP (MIS 3 to MIS 2) the environment was wetter and colder than the steppe–tundra to the east and west, with warming in parts of Beringia from c. 15,000 BP. These changes provided the most likely explanation for mammal migrations after c. 15,000 BP, as the warming provided increased forage for browsers and mixed feeders. Beringia did not block the movement of most dry steppe-adapted large species such as saiga antelope, woolly mammoth, and caballid horses. However, from the west the woolly rhino went no further east than the Anadyr River, and from the east North American camels, the American kiang-like equids, the short-faced bear, bonnet-headed muskoxen, and American badger did not travel west. At the beginning of the Holocene, some mesic habitat-adapted species left the refugium and spread westward into what had become tundra-vegetated northern Asia and eastward into northern North America. The latest emergence of the land bridge was c. 70,000 years ago. However, from c. 24,000 – c. 13,000 BP the Laurentide ice sheet fused with the Cordilleran ice sheet, which blocked gene flow between Beringia (and Eurasia) and continental North America. The Yukon corridor opened between the receding ice sheets c. 13,000 BP, and this once again allowed gene flow between Eurasia and continental North America until the land bridge was finally closed by rising sea levels c. 10,000 BP. During the Holocene, many mesic-adapted species left the refugium and spread eastward and westward, while at the same time the forest-adapted species spread with the forests up from the south. 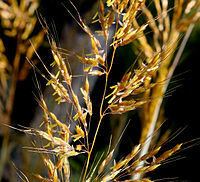 The arid adapted species were reduced to minor habitats or became extinct. Beringia constantly transformed its ecosystem as the changing climate affected the environment, determining which plants and animals were able to survive. The land mass could be a barrier as well as a bridge: during colder periods, glaciers advanced and precipitation levels dropped. During warmer intervals, clouds, rain and snow altered soils and drainage patterns. Fossil remains show that spruce, birch and poplar once grew beyond their northernmost range today, indicating that there were periods when the climate was warmer and wetter. The environmental conditions were not homogenous in Beringia. Recent stable isotope studies of woolly mammoth bone collagen demonstrate that western Beringia (Siberia) was colder and drier than eastern Beringia (Alaska and Yukon), which was more ecologically diverse. Mastodons, which depended on shrubs for food, were uncommon in the open dry tundra landscape characteristic of Beringia during the colder periods. In this tundra, mammoths flourished instead. The extinct pine species Pinus matthewsii has been described from Pliocene sediments in the Yukon areas of the refugium. The paleo-environment changed across time. 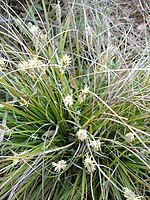 Below is a gallery of some of the plants that inhabited eastern Beringia before the beginning of the Holocene. The earliest Canis lupus specimen was a fossil tooth discovered at Old Crow, Yukon, Canada. The specimen was found in sediment dated 1 million YBP, however the geological attribution of this sediment is questioned. Slightly younger specimens were discovered at Cripple Creek Sump, Fairbanks, Alaska, in strata dated 810,000 YBP. Both discoveries point to an origin of these wolves in eastern Beringia during the Middle Pleistocene. The Bering land bridge is a postulated route of human migration to the Americas from Asia about 20,000 years ago. An open corridor through the ice-covered North American Arctic was too barren to support human migrations before around 12,600 BP. A study has indicated that the genetic imprints of only 70 of all the individuals who settled and traveled the land bridge into North America are visible in modern descendants. This genetic bottleneck finding is an example of the founder effect and does not imply that only 70 individuals crossed into North America at the time; rather, the genetic material of these individuals became amplified in North America following isolation from other Asian populations. Seagoing coastal settlers may also have crossed much earlier, but there is no scientific consensus on this point, and the coastal sites that would offer further information now lie submerged in up to a hundred metres of water offshore. Land animals migrated through Beringia as well, introducing to North America species that had evolved in Asia, like mammals such as proboscideans and American lions, which evolved into now-extinct endemic North American species. Meanwhile, equids and camelids that had evolved in North America (and later became extinct there) migrated into Asia as well at this time. A 2007 analysis of mtDNA found evidence that a human population lived in genetic isolation on the exposed Beringian landmass during the Last Glacial Maximum for approximately 5,000 years. This population is often referred to as the Beringian Standstill population. A number of other studies, relying on more extensive genomic data, have come to the same conclusion. Genetic and linguistic data demonstrate that at the end of the Last Glacial Maximum, as sea levels rose, some members of the Beringian Standstill Population migrated back into eastern Asia while others migrated into the Western Hemisphere, where they became the ancestors of the indigenous people of the Western Hemisphere. Environmental selection on this Beringian Standstilll Population has been suggested for genetic variation in the Fatty Acid Desaturase gene cluster and the ectodysplasin A receptor gene. Using Y Chromosome data Pinotti et. al. have estimated the Beringian Standstill to be less than 4600 years and taking place between 19.5 kya and 15 kya. Biogeographical evidence demonstrates previous connections between North America and Asia. Similar dinosaur fossils occur both in Asia and in North America. For instance the dinosaur Saurolophus was found in both Mongolia and western North America. Relatives of Troodon, Triceratops, and even Tyrannosaurus rex all came from Asia. Fossils in China demonstrate diffusion of Asian mammals into North America around 55 million years ago. By 20 million years ago, evidence in North America shows a further interchange of mammalian species. Some, like the ancient saber-toothed cats, have a recurring geographical range: Europe, Africa, Asia, and North America. The only way they could reach the New World was by the Bering land bridge. Had this bridge not existed at that time, the fauna of the world would be very different. ^ a b Shared Beringian Heritage Program. "What is Beringia?". National Park Service, US Department of the Interior. ^ Dr Barbara Winter (2005). "A Journey to a New Land". www.sfu.museum. virtualmuseum.ca. Retrieved 19 May 2015. ^ John F. Hoffecker; Scott A. Elias (15 June 2007). Human Ecology of Beringia. I have no energy Columbia University Press. p. 3. ISBN 978-0-231-13060-8. Retrieved 2016-04-10. ^ Karel Hendrik Voous (1973). Proceedings of the 15th International Ornithological Congress, The Hague, The Netherlands 30 August-5 September 1970. Brill Archive. p. 33. ISBN 978-90-04-03551-5. Retrieved 2016-04-10. ^ "The first people who populated the Americas". ^ a b Wang, Sijia; Lewis, C. M. Jr.; Jakobsson, M.; Ramachandran, S.; Ray, N.; et al. (2007). "Genetic Variation and Population Structure in Native Americans". PLoS Genetics. 3 (11): e185. doi:10.1371/journal.pgen.0030185. PMC 2082466. PMID 18039031. ^ Goebel, Ted; Waters, Michael R.; O'Rourke, Dennis H. (2008). "The Late Pleistocene Dispersal of Modern Humans in the Americas". Science. 319 (5869): 1497–1502. Bibcode:2008Sci...319.1497G. CiteSeerX 10.1.1.398.9315. doi:10.1126/science.1153569. PMID 18339930. ^ Fagundes, Nelson J. R.; et al. (2008). "Mitochondrial Population Genomics Supports a Single Pre-Clovis Origin with a Coastal Route for the Peopling of the Americas". American Journal of Human Genetics. 82 (3): 583–592. doi:10.1016/j.ajhg.2007.11.013. PMC 2427228. PMID 18313026. ^ Tamm, Erika; et al. (2007). Carter, Dee (ed.). "Beringian Standstill and Spread of Native American Founders". PLoS ONE. 2 (9): e829. Bibcode:2007PLoSO...2..829T. doi:10.1371/journal.pone.0000829. PMC 1952074. PMID 17786201. ^ Achilli, A.; et al. (2008). MacAulay, Vincent (ed.). "The Phylogeny of the Four Pan-American MtDNA Haplogroups: Implications for Evolutionary and Disease Studies". PLoS ONE. 3 (3): e1764. Bibcode:2008PLoSO...3.1764A. doi:10.1371/journal.pone.0001764. PMC 2258150. PMID 18335039. ^ Elias, Scott A.; Short, Susan K.; Nelson, C. Hans; Birks, Hilary H. (1996). "Life and times of the Bering land bridge". Nature. 382 (6586): 60. Bibcode:1996Natur.382...60E. doi:10.1038/382060a0. ^ a b Jakobsson, Martin; Pearce, Christof; Cronin, Thomas M.; Backman, Jan; Anderson, Leif G.; Barrientos, Natalia; Björk, Göran; Coxall, Helen; De Boer, Agatha; Mayer, Larry A.; Mörth, Carl-Magnus; Nilsson, Johan; Rattray, Jayne E.; Stranne, Christian; Semilietov, Igor; O'Regan, Matt (2017). "Post-glacial flooding of the Beringia Land Bridge dated to 11,000 cal yrs BP based on new geophysical and sediment records". Climate of the Past Discussions: 1–22. doi:10.5194/cp-2017-11. ^ Llanos, Miguel (21 September 2012). "Ancient land of 'Beringia' gets protection from US, Russia". NBC News. Archived from the original on 23 September 2012. ^ Hopkins DM. 1967. Introduction. In: Hopkins DM, editor. The Bering land bridge. Stanford: Stanford University Press. pp. 1–6. ^ a b c Hoffecker, John F.; Elias, Scott A.; O'Rourke, Dennis H.; Scott, G. Richard; Bigelow, Nancy H. (2016). "Beringia and the global dispersal of modern humans". Evolutionary Anthropology: Issues, News, and Reviews. 25 (2): 64–78. doi:10.1002/evan.21478. PMID 27061035. ^ Nesom, G. L. (2011). "A New Species of Erythranthe (Phrymaceae) From China" (PDF). Phytoneuron. 7: 1–5. ISSN 2153-733X. ^ Brubaker, Linda B.; Anderson, Patricia; Edwards, Mary E.; Anatoly, Lozhkin (2005). 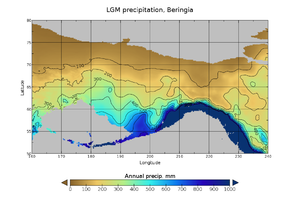 "Beringia as a glacial refugium for boreal trees and shrubs: New perspectives from mapped pollen data". Journal of Biogeography. 32 (5): 833–848. doi:10.1111/j.1365-2699.2004.01203.x. ^ [Lowe JJ, Walker M. 1997 Reconstructing quaternary environments, 2nd edn. Harlow, UK: Prentice Hall. ^ Miller, K.G. ; Kominz, M.A. ; Browning, J.V. ; Wright, J.D. ; Mountain, G.S. ; Katz, M.E. ; Sugarman, P.J. ; Cramer, B.S. ; Christie-Blick, N.; Pekar, S.F. (2005). "The Phanerozoic record of global sea-level change". Science. 310 (5752): 1293–1298. Bibcode:2005Sci...310.1293M. doi:10.1126/science.1116412. PMID 16311326. ^ Siddall, M.; Rohling, E.J. ; Almogi-Labin, A.; Hemleben, C.; Eischner, D.; Schmelzer, I; Smeed, D.A. (2003). "Sealevel fluctuations during the last glacial cycle". Nature. 423 (6942): 853–858. Bibcode:2003Natur.423..853S. doi:10.1038/nature01690. PMID 12815427. ^ Hu, Aixue; Meehl, Gerald A.; Otto-Bliesner, Bette L.; Waelbroeck, Claire; Han, Weiqing; Loutre, Marie-France; Lambeck, Kurt; Mitrovica, Jerry X.; Rosenbloom, Nan (2010). "Influence of Bering Strait flow and North Atlantic circulation on glacial sea-level changes". Nature Geoscience. 3 (2): 118. Bibcode:2010NatGe...3..118H. CiteSeerX 10.1.1.391.8727. doi:10.1038/ngeo729. ^ Meiri, M.; Lister, A. M.; Collins, M. J.; Tuross, N.; Goebel, T.; Blockley, S.; Zazula, G. D.; Van Doorn, N.; Dale Guthrie, R.; Boeskorov, G. G.; Baryshnikov, G. F.; Sher, A.; Barnes, I. (2013). "Faunal record identifies Bering isthmus conditions as constraint to end-Pleistocene migration to the New World". Proceedings of the Royal Society B: Biological Sciences. 281 (1776): 20132167. doi:10.1098/rspb.2013.2167. PMC 3871309. PMID 24335981. ^ a b Intergovernmental Panel on Climate Change (UN) (2007). "IPCC Fourth Assessment Report: Climate Change 2007 – Palaeoclimatic Perspective". The Nobel Foundation. ^ a b Clark, P. U.; Dyke, A. S.; Shakun, J. D.; Carlson, A. E.; Clark, J.; Wohlfarth, B.; Mitrovica, J. X.; Hostetler, S. W.; McCabe, A. M. (2009). "The Last Glacial Maximum". Science. 325 (5941): 710–4. Bibcode:2009Sci...325..710C. doi:10.1126/science.1172873. PMID 19661421. ^ Elias, S.A.; Schreve, D. (2016). Late Pleistocene Megafaunal Extinctions (PDF). Reference Module in Earth Systems and Environmental Sciences. pp. 3202–3217. doi:10.1016/B978-0-12-409548-9.10283-0. ISBN 978-0-12-409548-9. Archived from the original (PDF) on 2016-12-20. Retrieved 2017-05-04. ^ a b c d Guthrie RD. 2001 Origin and causes of the mammoth steppe: a story of cloud cover, woolly mammal tooth pits, buckles, and inside-out Beringia. Q. Sci. Rev. 20, 549–574. ^ Elias, S.A.; Brigham-Grette, J. (2007). "GLACIATIONS Late Pleistocene Events in Beringia" (PDF). Encyclopedia of Quaternary Science. p. 1057. doi:10.1016/B0-44-452747-8/00132-0. ISBN 9780444527479. Retrieved 2 May 2017. ^ a b c Hoffecker JF, Elias SA. 2007 Human ecology of Beringia. New York, NY: Columbia University Press. ^ a b Sher AV, Kuzmina SA, Kuznetsova TV, Sulerzhitsky LD . 2005 New insights into the Weichselian environment and climate of the East Siberian Arctic, derived from fossil insects, plants, and mammals. Q. Sci. Rev. 24, 533–569. ^ Burns, J.A. (2010). "Mammalian faunal dynamics in Late Pleistocene, Alberta, Canada". Quaternary International. 217 (1–2): 37–42. Bibcode:2010QuInt.217...37B. doi:10.1016/j.quaint.2009.08.003. ^ Gowan, E.J. (2013) An assessment of the minimum timing of ice free conditions of the western Laurentide ice sheet. Quaternary Science Review, 75, 100–113. ^ Rabassa, J.; Ponce, J.F. (2013). "The Heinrich and Dansgaard-Oeschger climatic events during Marine Isotopic Stage 3:searching for appropriate times for human colonization of the America". Quaternary International. 299: 94–105. Bibcode:2013QuInt.299...94R. doi:10.1016/j.quaint.2013.04.023. ^ Koblmüller, Stephan; Vilà, Carles; Lorente-Galdos, Belen; Dabad, Marc; Ramirez, Oscar; Marques-Bonet, Tomas; Wayne, Robert K.; Leonard, Jennifer A. (2016). "Whole mitochondrial genomes illuminate ancient intercontinental dispersals of grey wolves (Canis lupus)". Journal of Biogeography. 43 (9): 1728. doi:10.1111/jbi.12765. ^ Szpak, Paul; et al. (2010). "Regional differences in bone collagen δ13C and δ15N of Pleistocene mammoths: Implications for paleoecology of the mammoth steppe". Palaeogeography, Palaeoclimatology, Palaeoecology. 286 (1–2): 88–96. doi:10.1016/j.palaeo.2009.12.009. ^ McKown, A.D.; Stockey, R.A.; Schweger, C.E. (2002). "A New Species of Pinus Subgenus Pinus Subsection Contortae From Pliocene Sediments of Ch'Ijee's Bluff, Yukon Territory, Canada". International Journal of Plant Sciences. 163 (4): 687–697. doi:10.1086/340425. ^ a b c d e Dale Guthrie, R. (2006). "New carbon dates link climatic change with human colonization and Pleistocene extinctions". Nature. 441 (7090): 207–9. Bibcode:2006Natur.441..207D. doi:10.1038/nature04604. PMID 16688174. ^ a b c d Zimov, S.A.; Zimov, N.S. ; Tikhonov, A.N. ; Chapin, F.S. (2012). "Mammoth steppe: A high-productivity phenomenon". Quaternary Science Reviews. 57: 26–45. Bibcode:2012QSRv...57...26Z. doi:10.1016/j.quascirev.2012.10.005. ^ Westgate, John A; Pearce, G. William; Preece, Shari J; Schweger, Charles E; Morlan, Richard E; Pearce, Nicholas J.G; Perkins, T. William (2017). "Tephrochronology, magnetostratigraphy and mammalian faunas of Middle and Early Pleistocene sediments at two sites on the Old Crow River, northern Yukon Territory, Canada". Quaternary Research. 79: 75–85. doi:10.1016/j.yqres.2012.09.003. ^ Callaway, Ewen (2016). "Plant and animal DNA suggests first Americans took the coastal route". Nature. 536 (7615): 138. Bibcode:2016Natur.536..138C. doi:10.1038/536138a. PMID 27510205. ^ Hey, Jody (2005). "On the Number of New World Founders: A Population Genetic Portrait of the Peopling of the Americas". PLoS Biology. 3 (6): e193. doi:10.1371/journal.pbio.0030193. PMC 1131883. PMID 15898833. ^ a b c Tamm, Erika; Kivisild, Toomas; Reidla, Maere; Metspalu, Mait; Smith, David Glenn; Mulligan, Connie J.; Bravi, Claudio M.; Rickards, Olga; Martinez-Labarga, Cristina (2007-09-05). "Beringian Standstill and Spread of Native American Founders". PLOS ONE. 2 (9): e829. Bibcode:2007PLoSO...2..829T. doi:10.1371/journal.pone.0000829. ISSN 1932-6203. PMC 1952074. PMID 17786201. ^ Hoffecker, John F.; Elias, Scott A.; O'Rourke, Dennis H.; Scott, G. Richard; Bigelow, Nancy H. (2016-03-04). "Beringia and the global dispersal of modern humans". Evolutionary Anthropology: Issues, News, and Reviews. 25 (2): 64–78. doi:10.1002/evan.21478. ISSN 1060-1538. PMID 27061035. ^ Reich, David; Patterson, Nick; Campbell, Desmond; Tandon, Arti; Mazieres, Stéphane; Ray, Nicolas; Parra, Maria V.; Rojas, Winston; Duque, Constanza (2012-07-11). "Reconstructing Native American population history". Nature. 488 (7411): 370–374. Bibcode:2012Natur.488..370R. doi:10.1038/nature11258. ISSN 0028-0836. PMC 3615710. PMID 22801491. ^ Tackney, Justin C.; Potter, Ben A.; Raff, Jennifer; Powers, Michael; Watkins, W. Scott; Warner, Derek; Reuther, Joshua D.; Irish, Joel D.; O'Rourke, Dennis H. (2015-11-10). "Two contemporaneous mitogenomes from terminal Pleistocene burials in eastern Beringia". Proceedings of the National Academy of Sciences. 112 (45): 13833–13838. Bibcode:2015PNAS..11213833T. doi:10.1073/pnas.1511903112. ISSN 0027-8424. PMC 4653186. PMID 26504230. ^ Sicoli, Mark A.; Holton, Gary (2014-03-12). "Linguistic Phylogenies Support Back-Migration from Beringia to Asia". PLOS ONE. 9 (3): e91722. Bibcode:2014PLoSO...991722S. doi:10.1371/journal.pone.0091722. ISSN 1932-6203. PMC 3951421. PMID 24621925. ^ Amorim, Carlos Eduardo G.; Nunes, Kelly; Meyer, Diogo; Comas, David; Bortolini, Maria Cátira; Salzano, Francisco Mauro; Hünemeier, Tábita (2017-02-28). "Genetic signature of natural selection in first Americans". Proceedings of the National Academy of Sciences. 114 (9): 2195–2199. doi:10.1073/pnas.1620541114. ISSN 0027-8424. PMC 5338486. PMID 28193867. ^ Hlusko, Leslea J.; Carlson, Joshua P.; Chaplin, George; Elias, Scott A.; Hoffecker, John F.; Huffman, Michaela; Jablonski, Nina G.; Monson, Tesla A.; O'Rourke, Dennis H. (2018-05-08). "Environmental selection during the last ice age on the mother-to-infant transmission of vitamin D and fatty acids through breast milk". Proceedings of the National Academy of Sciences. 115 (19): E4426–E4432. doi:10.1073/pnas.1711788115. ISSN 0027-8424. PMC 5948952. PMID 29686092. ^ Pinotti, Thomaz; Bergström, Anders; Geppert, Maria; Bawn, Matt; Ohasi, Dominique; Shi, Wentao; Lacerda, Daniela R.; Solli, Arne; Norstedt, Jakob; Reed, Kate; Dawtry, Kim; González-Andrade, Fabricio; Paz-y-Miño, Cesar; Revollo, Susana; Cuellar, Cinthia; Jota, Marilza S.; Santos, José E.; Ayub, Qasim; Kivisild, Toomas; Sandoval, José R.; Fujita, Ricardo; Xue, Yali; Roewer, Lutz; Santos, Fabrício R.; Tyler-Smith, Chris (2018). "Y Chromosome Sequences Reveal a Short Beringian Standstill, Rapid Expansion, and early Population structure of Native American Founders". Current Biology. 29 (1): 149–157.e3. doi:10.1016/j.cub.2018.11.029. ISSN 0960-9822. PMID 30581024. Fagundes, Nelson J.R.; Kanitz, Ricardo; Eckert, Roberta; Valls, Ana C.S. ; Bogo, Mauricio R.; Salzano, Francisco M.; Smith, David Glenn; Silva Jr., Wilson A.; et al. (3 March 2008). "Mitochondrial Population Genomics Supports a Single Pre-Clovis Origin with a Coastal Route for the Peopling of the Americas". American Journal of Human Genetics. 82 (3): 583–592. doi:10.1016/j.ajhg.2007.11.013. PMC 2427228. PMID 18313026. Hoffecker, John F.; Elias, Scott A. (2007). Human ecology of Beringia. Columbia University Press. ISBN 978-0-231-13060-8. Retrieved 2016-04-10. Hoffecker, JF; Elias, SA; O'Rourke, DH (2014). "Anthropology. Out of Beringia?". Science. 343 (6174): 979–80. Bibcode:2014Sci...343..979H. doi:10.1126/science.1250768. PMID 24578571. Pringle, Heather (2014). "Welcome to Beringia". Science. 343 (6174): 961–3. doi:10.1126/science.343.6174.961. PMID 24578560.